You’ve invested a lot of time and money in orthodontic treatment to improve your smile. If you’re not careful, though, your teeth could actually move back to their old positions. The reason why is related to the same natural tooth-moving mechanism we use to straighten teeth in the first place. Teeth are held in place by an elastic, fibrous tissue called the periodontal ligament lying between the teeth and the jawbone and attaching to both with tiny collagen fibers. The periodontal ligament allows for incremental tooth movement in response to pressure generated around the teeth, as when we chew (or while wearing braces). Unfortunately, this process can work in reverse. Out of a kind of “muscle memory,” the teeth can revert to the older positions once there’s no more pressure from the removed braces. You could eventually be right back where you started. To avoid this, we have to employ measures to hold or “retain” the teeth in their new positions for some time after the braces come off. That’s why we have you wear a dental appliance called a retainer, which maintains tooth position to prevent a relapse. Depending on what’s best for your situation, this could be a removable retainer or one that’s fixed to the teeth. Patients typically wear a retainer around the clock in the immediate period after braces, and then eventually taper off to just nighttime wear. Younger patients must wear one for several months until the new teeth positions become more secure and the chances of a rebound diminish. For older patients who’ve matured past the jaw development stage, though, wearing a retainer may be a permanent necessity to protect their smile. 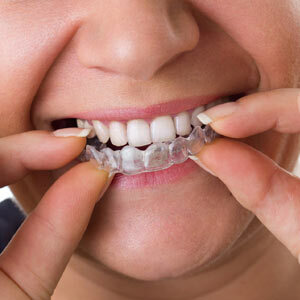 Retainer wear can be an annoyance, but it’s an absolute necessity. Think of it as insurance on your investment in a new, more attractive smile.